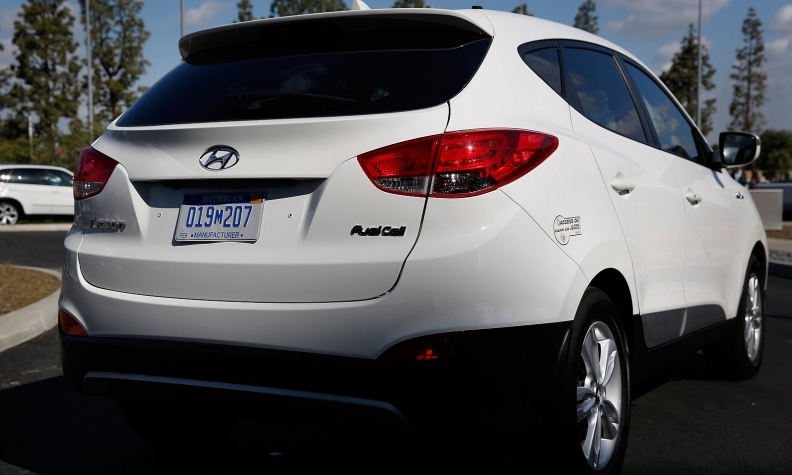 The biggest issue for Hyundai and other automakers is figuring out how to make and sell fuel cell vehicles profitably. CHICAGO -- The valet at the Hyatt Regency hotel rolls up in the hydrogen-fueled Hyundai Tucson and opens the front doors for me and a Hyundai communications executive. Pleasantries are exchanged and then we glide away silently into 10 degree winter weather. If the valet noticed that he was driving the future, he didn’t mention it. Indeed, looking at the Tucson fuel cell vehicle, you wouldn’t notice anything different from the standard-issue gasoline-powered version. Sharp eyes might notice the fuel cap is a bit larger. But that’s about it. I spent about 20 minutes driving one of the world’s most advanced vehicles in normal midday city traffic. It behaved no differently than any piston-engine vehicle, except it was smoother and quieter. The Tucson, available for lease now in Los Angeles for $499 a month, is proof that fuel cell technology is no longer a science experiment. Yes, automakers have had working fuel cell vehicles for years, but either the range or the refinement wasn’t there. Hyundai has largely conquered those problems. In an automotive fuel cell, power for the vehicle’s electric drive motor is generated by gaseous hydrogen entering the anode side of the fuel cell stack, while oxygen enters the cathode side. A chemical reaction splits the electrons and protons from the hydrogen. The electrons generate the electricity. The only byproduct is water vapor, no pollution. Each fuel cell in the Tucson’s stack generates 1 volt of electricity, so there are many cells in the Tucson’s electric motor, which is rated at 221 pounds-feet of torque. Acceleration is about equal to a 1.8-liter, non-turbo gasoline engine. The fuel cell Tucson is no rocket ship, but the electric motor generates more than enough verve to parry and thrust with the best of Chicago’s frenetic traffic. All fuel cell vehicles have an assortment of pumps and compressors to move the hydrogen and oxygen through the system, but you don’t hear them in the Tucson. I could sense no vibrations, either, just noiseless acceleration, much like a battery powered vehicle. Because I stepped out into the Chicago winter with no coat on, naturally I wanted to see how well the heater worked. It took no longer than usual -- about 5 minutes -- for warm air to arrive at the registers. Hyundai says the driving range on one tank of hydrogen is somewhere between 250 and 300 miles for most drivers. That solves at least some of the range problem. Most gasoline-powered cars go about the same distance between fill-ups. The problem now is that there are not enough hydrogen filling stations yet to make a fuel cell cars practical, and of course, the price has to come down. California is leading the nation in building hydrogen filling stations, but there are expected to be fewer than 50 open in all of California by the end of next year. The cost to install a hydrogen fuel infrastructure nationwide will be in the billions. Each station costs more than a $1 million each. California last year awarded FirstElement Fuel a $27.6 million grant to install 19 hydrogen stations in the L.A. area. Hyundai says the Tucson can be refueled in less than 10 minutes. 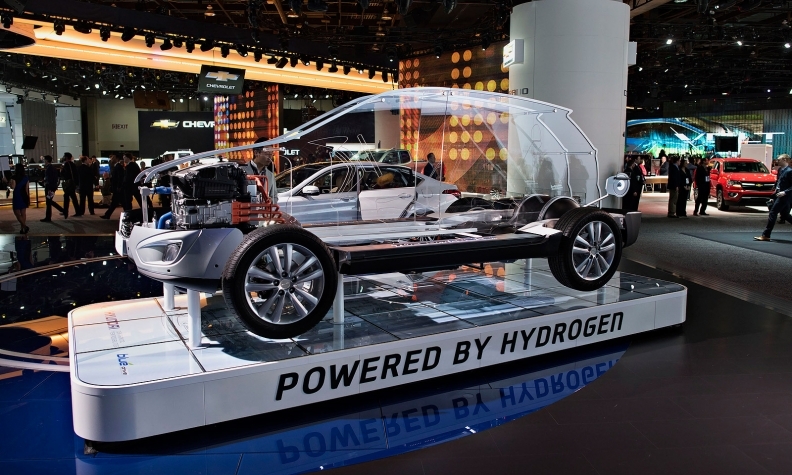 So, now the hydrogen fuel cell debate is no longer a chicken-and-egg conundrum. The fuel cell vehicle has arrived first. It works. Toyota plans to launch the swoopy Mirai fuel cell vehicle this year, while Honda’s is scheduled for next year, and GM promises a fuel cell vehicle -- possibly using technology in the Chevrolet Bolt -- by 2020. Perhaps the biggest issue for automakers is figuring out how to make and sell fuel cell vehicles profitably. Having driven the Tucson fuel cell vehicle, I can tell you there is nothing to fear. The technology works, the vehicle has all the same equipment as the regular Tucson and it doesn’t require any special maintenance to keep it going. But more important than that the Tucson requires nothing special of the driver. The Tucson make the transition from gasoline to hydrogen as seamless as possible. And that was one of the goals of the project, Hyundai spokesman Chris Hosford, told me at the Chicago Auto Show. 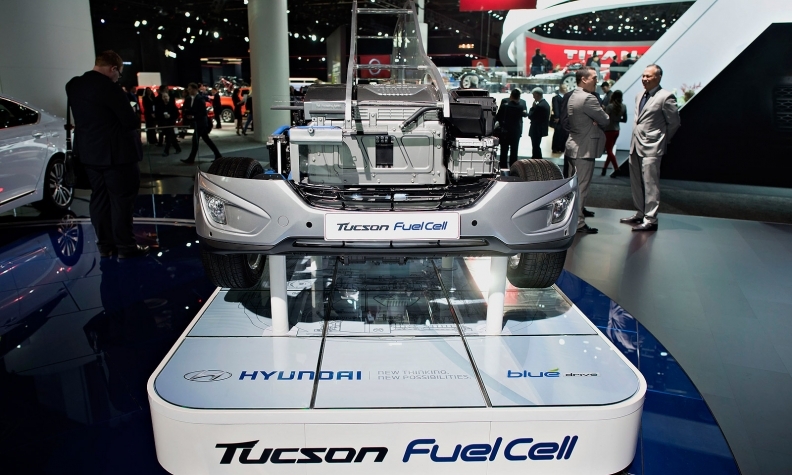 Of all the car companies, why is Hyundai devoting a considerable portion of its r&d budget to fuel cells? Surely, it could make more money using those funds to develop vehicles that customers want to buy, such as a pickup or a luxury SUV. 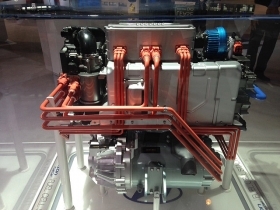 Hosford says Hyundai views fuel cell technology as a race in which the Korean automaker can compete and win against Mercedes-Benz, Ford, General Motors, Toyota and other global manufacturers with deep engineering resources. And because the technology is fairly new to automobiles, Hosford said, Hyundai saw the opportunity to establish itself as a leader. Based on my time in the fuel cell Tucson, I’d say Hyundai is well on its way to achieving its goal. And don’t be surprised if Hyundai strikes a deal with a major automaker -- German or American -- to either license its fuel cell technology or sell fuel cell powertrains.